Born in 1971 in Tblisi, Georgis, Nick Japaridze learnt painting with a group of famous artists in 1985 and between 1989 and 1994 he studied Fine Arts at Tbilisi State Academy. 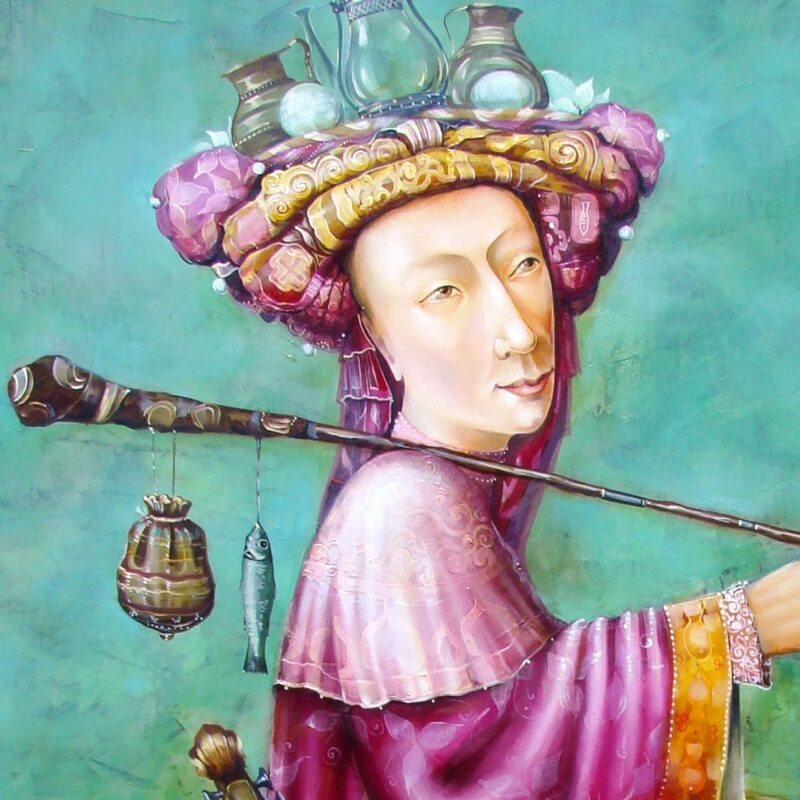 Nick Japaridze’s work is a combination of traditional Georgian murals, Asian decor and a medieval painting technique. Nick shows his emotions, moods and dreams through the symbolic language of his paintings. The artist gets inspiration by listening to meditation music while working. All the details of these works have a symbolic meaning and the characters created by Nick are variations of his moods. 2014 : “Nishat Gallery ” Istanbul, Turkey. 1995 : Business Center Tbilisi, Georgia. 1990 : Art gallery “Merani” Tbilisi, Georgia. 2014 : CULTUREINSIDE. gallery, Luxembourg “Imaginary Worlds”. 2012-2014 : “Outside The Square Gallery ” Margate, England. 2011 : SIGLETON-BISS museum of fine art Santa Fe NM, USA. 2010: “Masters Gallery” Greenwood Village, USA. 2009 : Gallery “Zuger” Santa Fe NM, USA. 2008 : GEORGIAN ART SHOW, Londron. 2008 : Art-space galleries, Pushkinhouse London. 2008 : MOCA Museum of Contemporary Art, Hot Springs, AR, USA. 2007 : Gallery “Zuger” Santa Fe NM, USA. 2007 : Gallery “Universe” Tbilisi, Georgia. 2006 : “The new generation in contemporary georgian” gallery Kopola” Tbilisi. 2002-05 : Gallery “Universe” Tbilisi, Prague. 2000 : Gallery “Hobby” Tbilisi, Georgia. 1999 : Gallery “Hobby” Tbilisi, Francfort. 1997 : Gallery “Hobby” Tbilisi, Georgia. 1996 : “Alter Ego”Gallery “karvasla”, Gallery “Hobby” Tbilisi, Georgia. 1995 : Munich, ST. Petersburg, Tbilisi, Georgia. 1994 : Rome, Brindizi, Moscow,Tbilisi. 1992 : “Mostra antolologica di pittori georgiani” Roma. 1992 : Brindizi, “Hammer Center ” Moscow, Tbilisi. 1991 : Central artist house Tbilisi, “Hammer Center” Moscow. 1990 : Central artist house Tbilisi, Kiev.